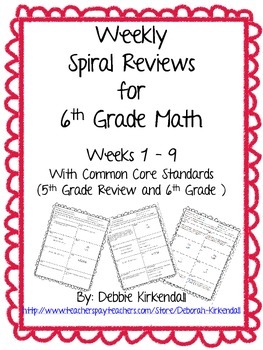 This file contains 9 weekly Spiral Review sheets for Sixth Grade Math. Includes review questions from the 5th Grade Curriculum mixed in as well. There are 8 questions for each worksheet. Each question is linked back to the CCSS from which it comes from. There are 9 total weeks. Or purchase my MEGA PACKS with Weeks 1-18 or Weeks 19-36 at a reduced price! Save money and buy the super saver Mega Pack containing Weeks 1-9 and Weeks 10-18. Save $2.00!! Save money and buy the super saver Mega Pack containing Weeks 19-27 and Weeks 28-36. Save $2.00!! Get a set for free buy purchasing all four sets together in my A Year's Worth of Sixth Grade Math Weekly Spiral Reviews! A $20 value for only $15! !